Participating in ASPIRE, students take an active role in evaluating their strengths and determining their areas of need when it comes to their academic and transitional needs. PARENT BROCHURE - Send home Parent Letter and ASPIRE Brochure with students right away! Then, send monthly reminders of the Self- Determination skills that the student is currently working on. 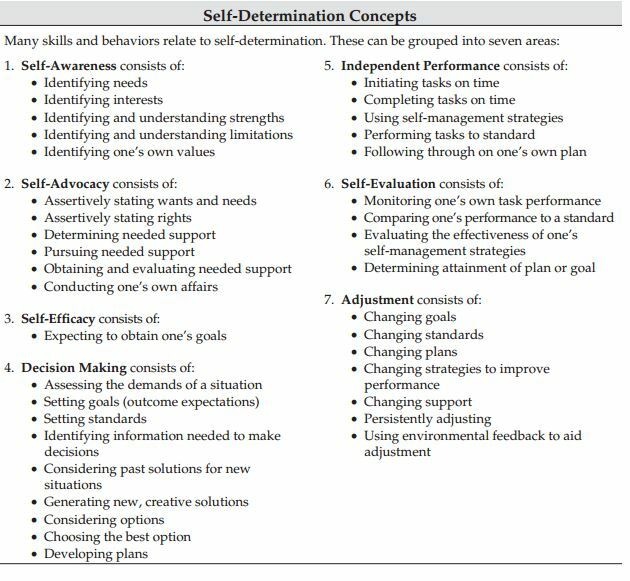 SDLMI separates the self determination skills into 3 categories of Self-Determined Actions. Volitional Actions: Making intentional, conscious choices based on one’s preferences and interests. ​Teaching and creating opportunities for choice-making, decision-making, goal setting, problem solving, and planning skills enables volitional action to develop. Agentic Actions: Self-directing and managing actions toward goals. Teaching and creating opportunities for self-management and goal attainment. problem solving, and self-advocacy skills enables agentic action to develop. ​Teaching strategies: Self-Direction: Allow students to make and learn from mistakes. • Teach language that can be used to advocate for personal rights and aspirations. • Provide opportunities for leadership roles. Pathways Thinking: Teach how to weigh potential costs, benefits, and outcomes of choices. • Encourage ownership of challenges and solutions in problem solving. Create opportunities for students to problem solve in structured and naturally occurring environments. Action-Control Beliefs: Recognizing your own abilities and believing they will help you achieve your goal. Teaching and creating opportunities for self-awareness and self-knowledge. enable Action-Control Beliefs to develop. Teaching strategies: Psychological Empowerment: Set high expectations. •Encourage students to identify their strengths and apply them. •Support students in selfevaluation to encourage belief in abilities and increase self-confidence. Self-Realization: •Teach students to understand their strengths and support needs •Encourage students to Identify and utilize personal support systems (i.e., friends, family, teachers). •Provide opportunities for students to become knowledgable about available supports and to advocate for them. Assess the student's awareness of their own skills. This Inventory (SDI) is used to give students a scale score on their current level of self-determination. With too much confusion with which students are or are not ASPIRE students, CGCA decided to scale-up to Full Implementation this year. Student Pre-tests – to be done by September 30th, 2017. All teachers at CGCA will participate with three students. ASPIRE School Contact & Parent Contact Kickoff Training on August 29th, 2016. Student Pre-tests – to be done by September 30th, 2016. Student Training – Done by the Teacher with the student. ​This includes teaching self-determination skills. Parent Training - We are partnering with SCCPSS for the Parent Training. December 8th @ Islands High School. December 9th @ Groves High School. ​next year will be discussed at the end of this one. Select Teachers – Summer of 2015. All teachers at CGCA will participate with at least one student. Student Pre-tests – to be done by September 25th, 2015. Teachers will send an email verification when completed.